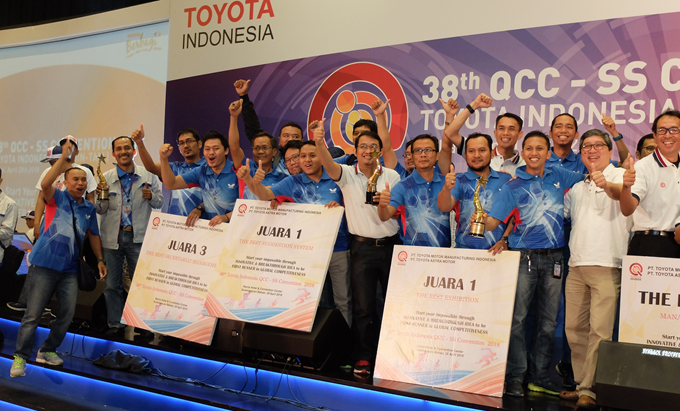 Toyota Indonesia again held a 38th Quality Control Cycle & Suggestion System (QCC - SS) Convention or Quality Control Group (GKM) on Saturday, April 28, 2018. The theme for the QCC - SS convention this year is creating innovation of the working quality through a breakthrough idea to strengthen the company competitiveness. The purpose of the QCC-SS convention is to strengthen the corporate culture and mindset innovation & breakthrough of every employee to achieve autonomy to innovate, communicate harmoniously and improve good teamwork in all process lines, one of them by doing QCC - SS - Cross Function Improvement ( CFI) in production field and supporting thoroughly and continously. This Quality Control Circle & Suggestion System (QCC - SS) activity that started by Toyota Indonesia since 1982 provides various suggestions and improvements from employees generated from this activity. More than 6800 TMMIN employees and more than 100 TAM employees have been joining QCC activities this year, that join the QCC group and completing more than 1100 problem solving themes, and 130 thousand conceptual ideas in 2016 - 2017. At this year's QCC - SS convention the level of management participation and participants increased 61 people. The participation of participants in several categories also increased, such as secretariat management participation that increased from 10 to 14 secretariats, promotion managers increased from 13 managers to 21 managers, circle leader managing activity (CLMA) participation increased from 21 circles to 24 circles and number of participation from cross function improvement (CFI) team also increased 10% from 2017.